My cancer has a hashtag?! Oh my. 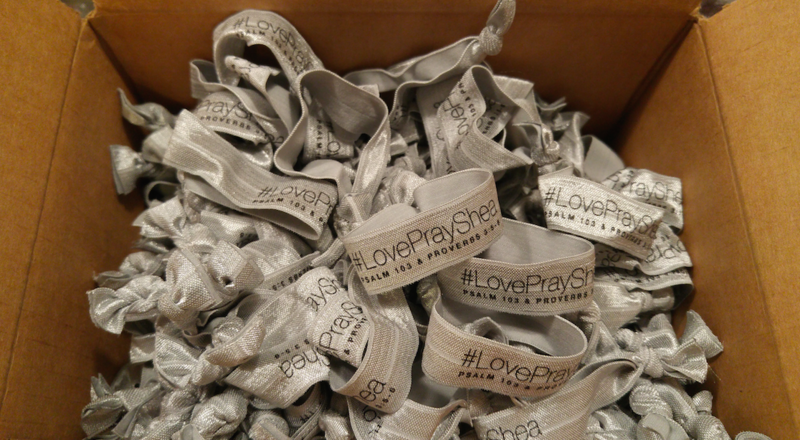 My sisters walked in with a box full of the coolest little bands printed with #LovePrayShea. Seriously, it’s very surreal, strange and exciting to see my name on one of those special reminder bracelets you see people wear who are praying for someone in need. Seeing how many were in the box made me well up at the thought of this many people supporting our little family. I got excited and emotional and felt wierd all at one! Haha! It really blows my mind. Printed below my hashtag are two of my favorite verses: Psalm 103 and Proverbs 3:5-6. Proverbs 3:5-6 has been one I’ve clung to for years, probably since college, and especially now. I take such comfort in not needing to figure everything out. In truth, you’re not going to understand most of the things that happen in your life until you get to heaven. Be patient. God knows what He’s doing. God knows what’s best for you. He can see the end result. You can’t. All my problems, heartaches, difficulties and delays — all the things that made me ask “why” — one day it will all be clear. But for now, we’re learning to trust God. I just don’t even know what to say. We are just so thankful.